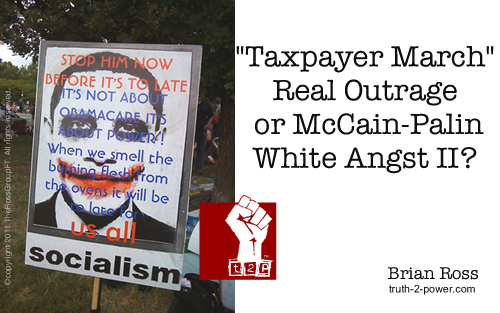 “Taxpayer March” – Real Outrage or McCain-Palin White Angst II? Are we seeing the dividends of John McCain’s 11th hour attempt to use white fear and anger to launch himself into the Oval Office? The “Taxpayer March” that is expected to draw between 2,000 and 200,000 people to the streets of Washington, D.C. represents a hodge-podge of interests from Birthers to Bailout Bashers to Health Care Hysterics. See the story at Politico.com. Like those aerial cam shots of schools of sharks swarming off of some eastern seaboard town, today cameras will get to watch what happens when the GOP scrapes up a smorgasbord of screw-loose-sharks and dumps a bucket of political blood from the Wilson nonsense on to the streets of Washington, D.C. to stir them into a feeding frenzy. If the events leading up to the “march” are any indication, they will be white, largely middle and lower-middle income and angry. Politico calls into question whether they represent a movement, or they are just the scrapings of the bottom of the Reactionary Right’s Tea Party movement scam. They are John McCain’s people. His contribution to American politics. Yes, the white angst and anger that both the dyed-in-the-wool and the closet racists share was always there. McCain, though, in the final days of his campaign, wheeled in the microphones and the cameras in for a close-up on a small part of society that is seldom heard. They gave that white angst about a black man running the country shape and form, molding a Joe the Plumber out of that racist, xenophobic clay, and dropped Sarah Palin, Miss White Angst of 2008, into his team to capitalize on it. These are indeed Joe Wilson’s people – Ignorant 99% white Americanists who somehow feel that they are losing “their country.” They are easily manipulated, as they will believe just about anything that is dropped in front of their face that affirms their world view. They have bought into the Birther business. They turned out for tea parties. 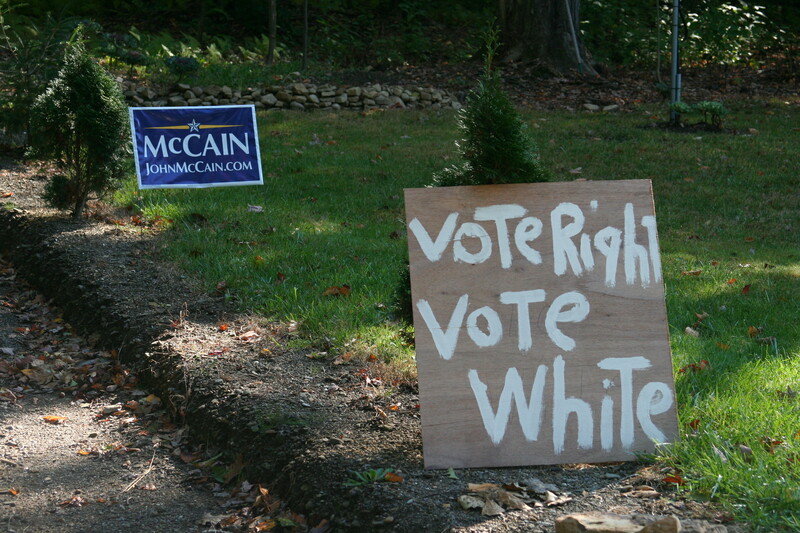 They are the tiny, louder, more radical fraction of the 57% of white voters who voted for McCain. Everyone has a right to speak their mind in this country, and they will speak theirs. The GOP machine politicos who are organizing them want us to see a country in outrage against our black liberal socialist president. A television moment for Fox and CNN to display the outrage that “taxpayers” have against every Obama policy and practice. Their puppeteers are using the event to amplify the thorny “liar” crown that they wish to stick upon President Obama. This is not about a black man in office for the white men behind the scenes. It is about throwing human debris in the path of change. They are the pawns of a corporate America which has profited from complacency and ignorance, which apparently fears the return of regulation and accountability that they have spent, since the days of Ronald Reagan, billions to employ the right people in government to aid in its dismantling. Today’s “march” is a bit of pageantry to back-stop the shameless shouting of Congressmen Joe Wilson, to try and give his alleged personal white angst resonance with an audience hungry for something to legitimize their fears. Their masters know, as they did when they tried using this during the campaign, that these mock rallies are good for ratings, and, while many more civilized whites will never stand out on the sidewalk with their wacky hats and signs, that broadcasting that shadow of doubt daily keeps that fear alive for the day that they have another crack at the White House in 2012. Yes, Senator McCain, you should be proud. You have served your corporate constituents well. You have given fear and ignorance a place on the political stage for as long as a president of a skin color not in favor with this slice of white America sleeps in “their” White House. You have given us Joe the Plumber, and Sarah Palin, who still haunt the political discourse. You are the Jerry Springer of politics. I hope that it is a legacy of which you can be proud. This entry was posted on September 12, 2009 by Brian Ross in 2009, Birthers, D.C., Glenn Beck, GOP, Huffington Post, Joe Wilson, John McCain, Politico, Racism, Republicans, Tea Party and tagged Americanists, Barack Obama, Fox News, Gop, Jerry Springer, Joe The Plumber, Joe Wilson, John McCain, Media, Media Circus, Politics, Politics News, President Obama, Republican, Republicans, Right-Wing Media, Sarah Palin, Senator McCain, Taxpayer March, Tea Party Movement, White Angst.